It’s 4th May – not only is it Star Wars day (May the Forth be with you! ), it’s also the first day of a new annual IT survey designed to help make working and studying here even easier. 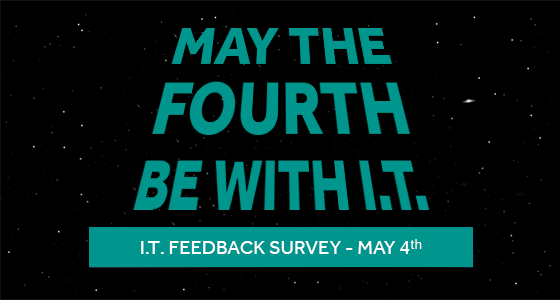 When they’re not battling the Dark Side, IT work to improve information services across the University – and they need your views and feedback to identify future improvements. Is there a new way of working or a new service that would improve your life at the University? Please spare 5 minutes to complete the survey online by Friday 25 May. For further information, please contact IT.